For high densities you can look at the custom rankings - once about 1/3 of the board is filled the chance of being able to solve patterns using logic drops substantially. The 16x30 custom WR has a density of 33.5%, and the 24x30 custom WR has one of 31.3%. After that point, even on small boards, you are more or less constantly relying on guesswork - higher densities (anything up to one or two squares unfilled, basically) are more or less unplayable even on a beginner board. Int and Exp density is good for large board records because you're mostly still going through realistic patterns, but your suggested 50% density event would basically be a contest of pure patience and luck, like asking people how many heads they can get in a row while flipping a coin. Oh yeah, I got another PB recently (posted on the guestbook), a fourth 45. Is that considered Elmar syndrome yet? Although amounts of luck increase substantially, there is still lots of room for strategy, mostly probabilistic but still existent. I've done a beginner board up to about 43% density (and according to Custom Rankings, some have gone over 50%), and I'd say there's still more strategy than luck at that level. The problem is that it only takes one instance of luck to lose a game of minesweeper, but the rate at which that happens is still fairly high at Intermediate and Expert densities. When doing larger and larger boards, the only reason for an increased difficulty is due to the proportionally larger number of instances where luck is required. An expert density board that is large enough involves as much guessing as a 50% density board that is small enough. I'm guessing it took you very many tries to complete the 43% density beginner board, right? Suppose it took you 100 tries (100 hits of F2), which is IMO already a pretty low estimate. Then it would probably take you about 100^4 = 100 million tries to play a 16x16 board of that density. And to play an expert board of that density, you can expect to try about 100^12 = one trillion trillion tries. So yeah, strategy is completely dwarfed by luck at densities like that. In fact, as the board gets bigger, the number of 50-50 patterns, 33-33-33 patterns, stuck situations, etc. should become more and more constant (law of large numbers). Perhaps, if there was a clone that let you track a "score" of the number of times you hit a mine, it might be interesting to compete on large and dense boards to see who can get the lowest score. With boards of expert density, though, it would still be an exponentially increasing need of guessing, just much smaller due to the smaller base for the number of guesses (and consequently also growing at a smaller rate). So, yes, 50% density is drastically more luck-intensive than 20% density, but by the same token 20% density is drastically more luck-intensive than, say, 10% density, but it is still within the general range of tolerance. 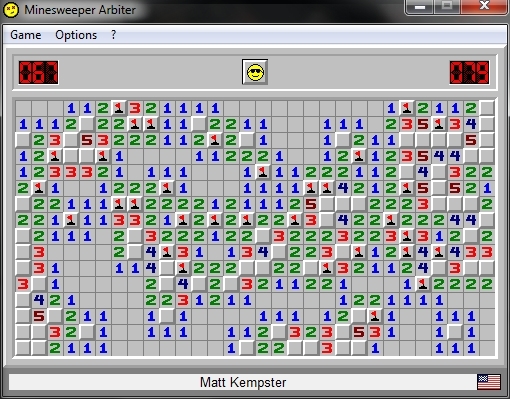 What happens seems to be the setting of some "magic number" above which luck is "ridiculous," although on reflection I think there probably is a good mathematical reason for your stated one-third density because the number 3 is intrinsically of importance to minesweeper strategy. I've actually thought about what a "Score system" would be like for certain high-density Custom boards before. Sum of numbers successfully revealed seemed to me like an interestingly good measure of it, although mathematically this method of scoring seems coincidental, from which there is probably a much better way of doing it analogous to the difference between 3BV/s and HZiNi/s. Hate to break up the conversation here, but I am now officially a world ranker! Could've done a bit better but I won't complain. This puts my sum at 99.67. For some reason, attachments aren't working. You can check out the replay whenever Damien uploads it. In the meantime, here's a screenshot so you can fantasize about how the solve went. I finished in the upper left, shortly after discovering that in the bottom left. Generally, when dealing with a low 3BV board, I assume that boxes like those are filled. I don't know why, but any time I encounter a 140 or lower 3BV board with a pattern like that, it has a mine in it. It wouldn't've been a long trek if it didn't have a mine. As for NF... maybe I'll try. aradesh wrote: any time I encounter a 140 or lower 3BV board with a pattern like that, it has a mine in it. Such mines would tend to make for lower 3BV boards (although only by a fairly small amount), as it lessens the need for clicks. In that mine were moved to say, the middle of an opening, one extra click would be necessary where the mine was, and if it were to be moved to the edge of an opening, even more clicks would be required. Finally got 50x sub50! All NF, of course. Has anyone else (other than Kamil & me) done this? qqwref wrote: Has anyone else (other than Kamil & me) done this? manu most likely has. for others it wouldn't take more than 2 months but they just don't care enough. i have 16 nf sub50s but i don't intend to play much more nf. EWQMinesweeper wrote: manu most likely has. I wouldn't be so sure. We'll have to ask. EWQMinesweeper wrote: for others it wouldn't take more than 2 months but they just don't care enough. i have 16 nf sub50s but i don't intend to play much more nf. Anyone can talk about how great they are, but I'll believe it when I see it. For now, well, I started sweeping after most top20 players were already world ranked, and I'm one of the first few people to do this, so I think that speaks for itself. Nice job QQ. You deserve to pass me in the rankings soon IMO. I'm sure Kamil would hold it if he knew what his pb was. Awesome HZiNi/s! My best is only 2.90. 48.73 on a 164 board @ 3.36. My highest 3bv board for a sub50. My personnel best scores. Minesweeper version used was ViennaSweeper__2.2. I have attached the videos of the above games along with this post. How can i join the rankings in this site? This game played itself tonight... It was an IOE (about 1.060 -> 1.106, how do I know what my record was in Arbiter? ), 3bv/s (3.62 -> 3.88), and IOS (who cares) record. I was quite stunned that I managed such a high IOE, saving 22 clicks over 3bv (although it's not so surprising considering the demonstrated weakness of 3bv at high values). The correctness at this (for me) slightly higher than usual cl/s was also quite a surprise. These days I get around 0.95 correctness on avg. Anyhow, I'm enjoying this spurt of form very much .